The following content is brought to you by our partner, the Caesars Palace. Daredevil motorcycle jumps. Heavyweight bouts. World-class tennis and Formula One racing. The rich, 50-plus-year history at Caesars Palace has included many amazing sporting feats and events. Opened Aug. 5, 1966, by hotelier Jay Sarno, the opulent hotel was Vegas’s first themed resort, launching with approximately 700 rooms among 14 stories. Today, Caesars Palace spans 85 acres in the heart of the Strip, with six hotel towers, including the world’s first Nobu Hotel, and nearly 4,000 rooms, including 300-plus suites. VIDEO: Preview: Evel Live Watch a preview of the 3-hour special Evel Live, kicking off Car Week on Sunday, July 8 at 8/7c. 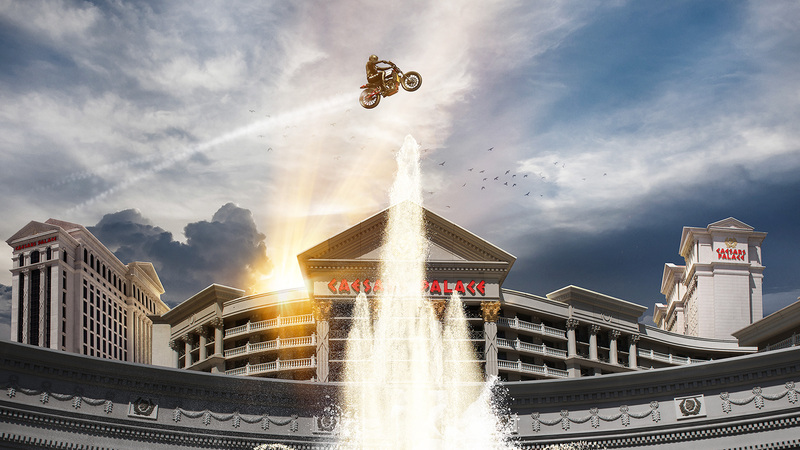 Come experience the magic of Caesar’s Palace for yourself with an exclusive rate for HISTORY™ viewers! Get up to 30% off your next getaway. Available for stays now through December 28, 2018. Must book by July 31, 2018. Blackout dates apply. Subject to availability. Management reserves all rights. What Drove Evel Knievel to Keep Battering His Body?